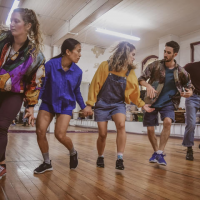 Continuous and collective movement: shared experience across defined space, this is the joy inherent in Participation by Footnote New Zealand Dance. Choreographed by Swiss based New Zealander Emma Murray, Footnote will present a special gallery performance of Participation on Saturday 4th May at The Dowse. Combining Participation with an additional improvisation by dancers throughout the gallery, this unique experience provides a different perspective on the way that art-forms connect with and respond to our lives. Original generation time 0.0595 seconds. Original generation time 1.9500 seconds. Cache Loaded in: 0.0008 seconds.